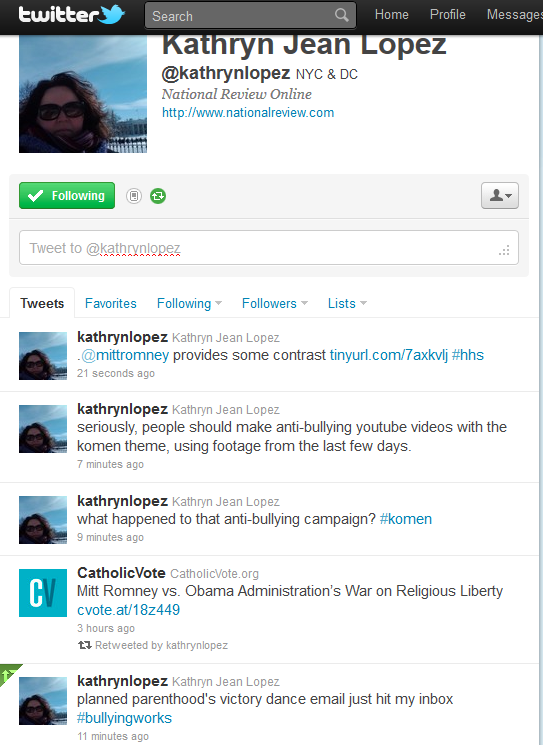 Poor Kathryn Jean Lopez, the National Review Online's resident delicate flower, anti-feminist traditional Catholic, and enemy of all homosexualists and abortionists. She was so delighted when Susan G. Komen for the Cure announced that it would no longer be sending grant money to Planned Parenthood to fund breast cancer screenings and mammogram referrals, because it meant that her side had "won" a battle in the war against women's health providers that perform abortions and provide contraception. After a great deal of public outcry, Komen reversed itself and said Planned Parenthood would be eligible for future grants. This, obviously, was very sad news for K-Lo. 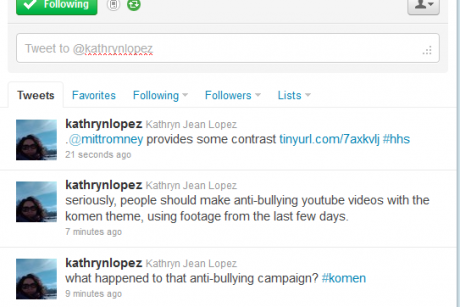 She seemed stunned at first, but then decided that Komen was the victim of bullying. Lopez, like many conservatives whose baffling interpretation of common liberal concepts leads them to find "hypocrisies" where none exist (Michelle Obama ate a french fry!!!! ), darkly mutters about "that anti-bullying campaign," because accusing a massive charitable foundation of playing politics with its supposed mission is patently the same thing as humiliating vulnerable young people until they become suicidal.